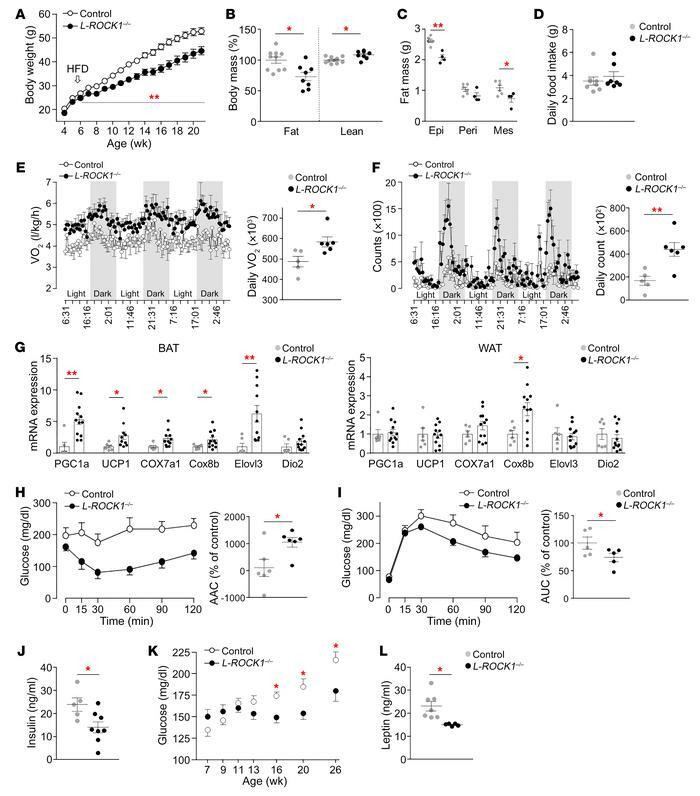 Hepatic ROCK1 deficiency protects from diet-induced obesity and insulin resistance and increases energy expenditure. Body weight (n = 14−16 per group) (A), body mass measured by an MRI (14 weeks of age, n = 6−10 per group) (B), fat mass (26 weeks of age, n = 4−6 per group) (C), daily food intake (n = 7 per group) (D), O2 consumption (n = 5−6 per group) (E), locomotor activity (n = 5−6 per group) (F), thermogenic gene expression in brown adipose tissue (BAT) and epididymal white adipose tissue (WAT) (n = 6−12 per group) (G), blood glucose during insulin tolerance test (ITT) (H) and glucose tolerance test (GTT) (I), serum insulin (J), random blood glucose (K), and serum leptin levels (L) were measured in ROCK1loxP/loxP (control) and albumin-Cre;ROCK1loxP/loxP (L-ROCK1–/–) mice fed an HFD (n = 6−10 per group for H–L). Mice were fed an HFD from 6 weeks of age. Epi, epididymal fat; Peri, perirenal fat; Mes, mesenteric fat; AAC, area above the curve; AUC, area under the curve. O2 consumption and locomotor activity were assessed by CLAMS at 18 weeks of age. Thermogenic gene expression was measured from overnight-fasted mice at 22 weeks of age. ITT and GTT were performed at 16−17 weeks of age. Serum parameters were measured from overnight-fasted mice at 18 weeks of age. Values are means ± SEM. *P < 0.05 vs. control, **P < 0.01 vs. control by unpaired Student’s t test.